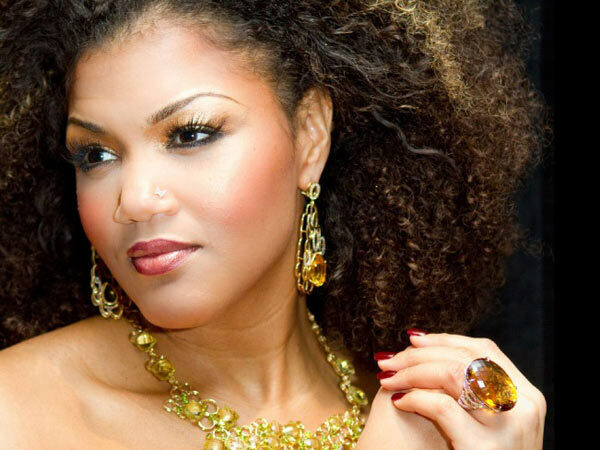 Roy Thomson Hall kicked off its vocal series with Canadian soprano Measha Brueggergosman, accompanied by German pianist Justus Zeyen, and it was quite a lovely recital. The themed concert was titled Night and Dreams, which, not coincidentally, is the name of Brueggergosman and Zeyen’s new recording for Deutsche Grammophon. The songs avoided sounding too similar of mood by crossing three languages and a variety of composers – Mozart, Schubert, Schumann, Duparc, Turina, Chopin, Berg and Richard Strauss. While the German lieder showed Brueggergosman’s formidable control and nuanced expression, the French art songs by Duparc allowed her gorgeous voice to soar – the bright sounding top, the creamy middle and the woody lower register. Zeyen had two piano solos by Schumann and Chopin which showed off his skills, both the speed and the reflection. The singer has developed into a very expressive artist. Brueggergosman looked glamorous, every inch a diva, while Zeyen proved to be a sympathetic interpreter who made the piano an equal partner.